While pregnancy brings joy to the whole family, it also bring changes on the Mum both emotionally and physically. Let's talk about physical changes, these includes the pretty and beautiful ones such as nicer skin, thicker & healthier hair, expanding belly, fuller breasts, then there are the not so pleasant ones such as leg cramps, swollen feet, frequent pee breaks, stretch marks, pigmentation on the face, joint pains etc. Of course different women experience different changes. For me it was eczema, a very bad eczema on my left feet that has been with me since I was pregnant 12 years ago. Initially it was a small patch and itches on some days but it got a little bit worse after I gave birth. As years goes by it spread a little bit and got bigger, it's now has a noticeable white flaky patch on my feet that tends to draw attention from others. Worse of all, it gets dry and itchy most of the days now, some days it is so itchy that I can't stop myself from scratching and before I knew it, the skin broke and it bleeds. It is not a pretty sight when that happens. I have tried various creams that did little help to ease my agony, I even tried creams with steroids but I stopped using it after a week because I didn't like putting steroids in my body even though there were some improvement on the eczema. I am talking about our very own, made in Singapore brand - Theo10®. I got to know about this brand by chance earlier this year, I was looking for some organic greens in a fair when I see this young chap standing at the booth blabbering off, trying to introduce his products to the small group of people. This 乳臭未干 or callow looking young chap is actually the founder Theodore Khng (opps! 有眼不识or-yee-or!!!). So, long story short, Theodore let every one did a sample try/test on his products on the spot and I could immediately feel the minty, warm feeling from Theo10® Heat (Retail Price SGD8) minutes after application. And that is when I shamelessly asked if he is interested to work with us (hahaha! ), half jokingly but he got serious and asked me tons of questions about it. Couple of weeks later, a nice package with the full range of Theo10® products arrived at my humble house. I started off using Theo10® Moisturize (Retail Price SGD45) on my eczema, this ubberly moisturizing cream with a faint citrus smell that I love~ I applied generously on the patch and it got absorbed in by the skin fairly quickly, plus it does not leaves a sticky or oily residue on the skin after application. How can it be so moisturizing? This is because of the organic cold pressed French Jojoba oil and Thai Virgin Coconut Oil in it. 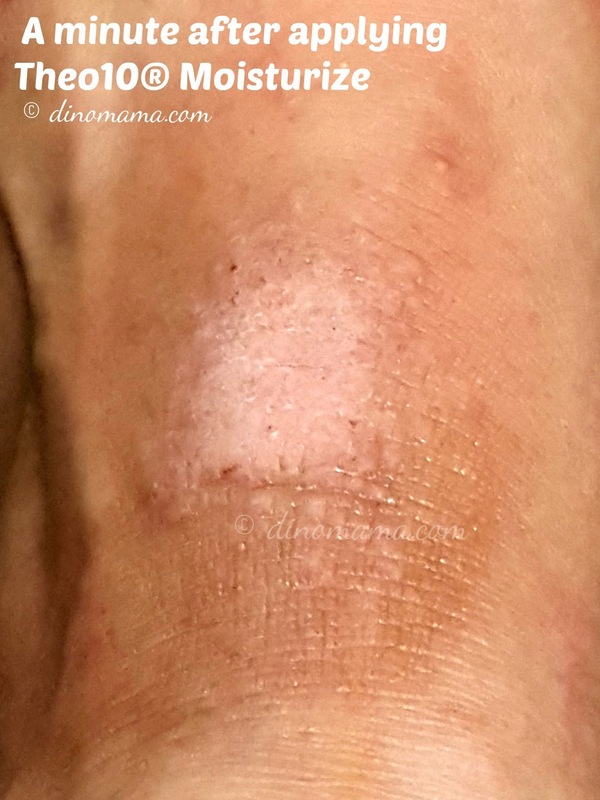 The result can be seen almost immediately as you can see from my photos below, the patch does not look as fierce nor as itchy as before and I felt so much relieved. 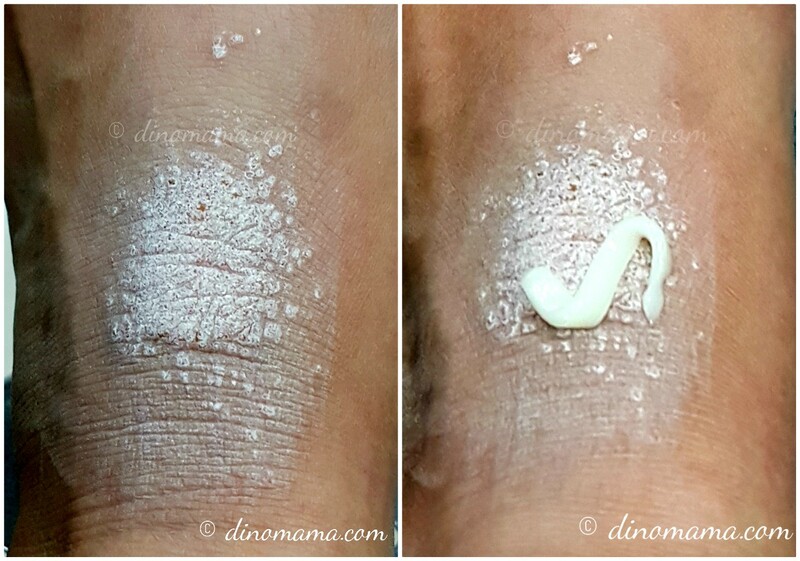 3 days after I diligently apply the moisturizer day & night, the broken skin had healed. the brown patches near the ankle also looks lighter and not so dry. I continued to apply the moisturizer for the weeks though some days I missed the night application. About 1 week ago I suddenly remember that I can apply Theo10® Eczema (Retail Price SGD12) non steroid cream together with the moisturizer. Like the moisturizer, the cream is also easily absorbed by the skin. With these 2 creams working on my eczema for nearly 2 months, you can see from the photo below that the patch is less swollen and skin condition around it is so much better! Do you know why? Besides the organic Jojoba and coconut oil I mentioned earlier, inside the moisturizer there are these ingredients that aids the skin repair and recovery. The certified organic essential oil such as Geranium that has antiseptic, antibacterial properties, Chamomile that soothes red, dry and irritated skin and has a calming effect on allergies, psoriasis, eczema and other dry skin conditions. Aloe vera that are well know for its wound healing and anti-inflammatory properties that reduce skin inflammation. The organic Peppermint essential oil in the eczema cream gives a minty feeling that prevents the itch thus I do not have the urge to scratch and aggravate it further. Neem oil has a high level of antioxidant that helps improve the skin condition. Word of caution : Your fingers may have the eczema cream residue, even after a few washes with soap, so be careful not to let your fingers come in contact with eyes coz the peppermint or the minty sensation will irritate or sting the hell out of you. First and foremost, eczema is triggered by our ever changing hormones and by the food we consumed. So to fully recover from eczema we really have to strike a balance in our emotional state of mind and well being of our body, finding out the food causes the flare up and avoid them like the plague, while we are doing that we need ointment and cream to ease our discomfort. Does the product works? Well, you can see from the photos in this post that it absolutely works! After more than a decade I am happy to share that my agony has finally ended! Best part of the find is the products are affordable and made with only 100% natural ingredients. Much as I wished that my eczema miraculously disappeared over night, it didn't but instead the cream helps keep it under control and improve it significantly. And if I am able to keep my itchy fingers from scratching it on day(s) that I forgot to apply the cream, I believe the condition will be much better than the photo shown above. If you have eczema issue, I strongly suggest that you get these 2 products to try. Of course, like any other remedies it also takes a lot of effort to diligently apply the cream on the affect area; something I have to work harder on, and patience to wait for the the result to show in weeks or even months time. So don't be disappointed or despair when you see no great leap of improvement, there may be already some just that it is not noticeable yet. Theo10® has come out with an affordable Christmas Gift set, retailing at only SGD22. 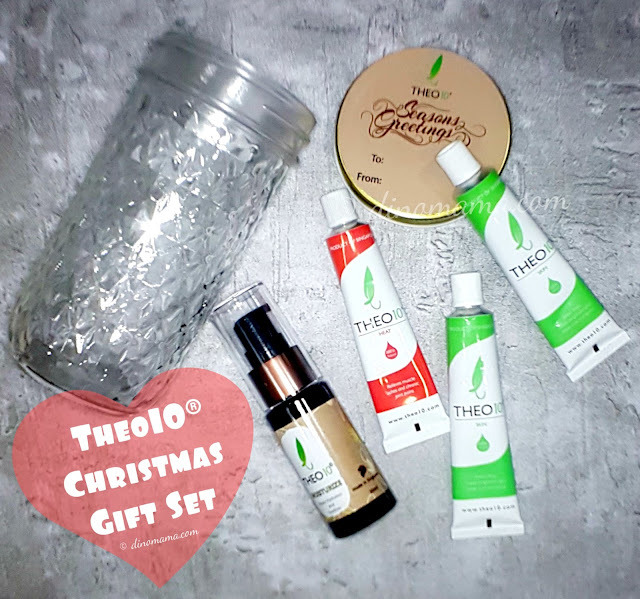 The set comes in a beautiful mason jar containing x2 Theo10® Skin, x1 Theo10® Heat and x1 limited edition 30ml Theo10® Moisturize. Great gift set for gift exchange with friends or colleagues! Grab them now before they are gone! 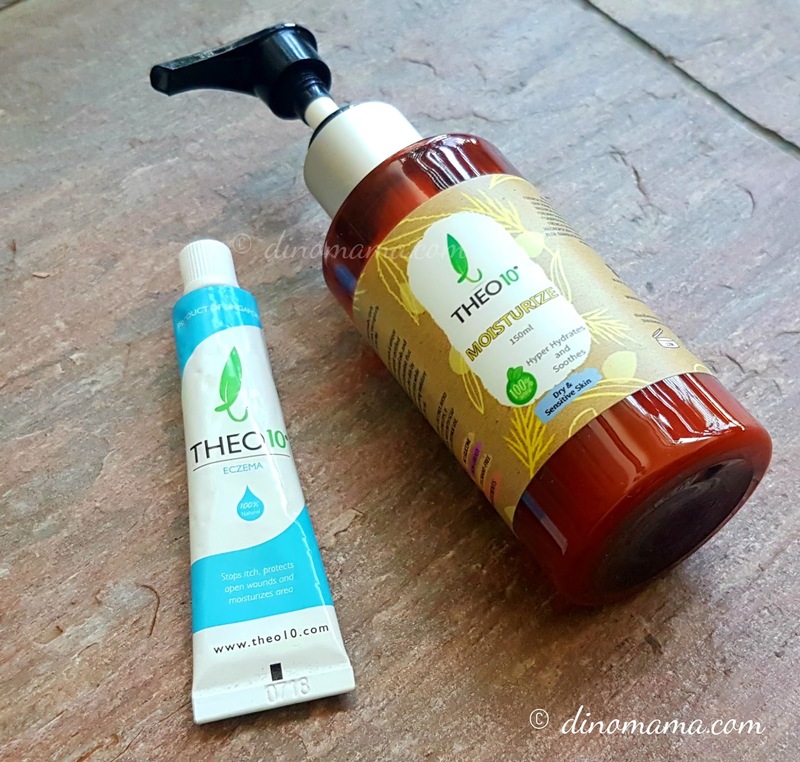 Disclaimer : We received Theo10® products for the purpose of reviewing and this post. No other compensation was received. All opinions are based on our usage and experience with the products. All photos in this post belongs to The DinoFamily, you may not use them without asking for our permission.